“This is Not a Book: Long Forms of Attention in the Digital Age”, a talk by Alan Liu. Tuesday, June 3rd at UCR! If you have any questions, please contact Rebecca Addicks-Salerno (raddi001@ucr.edu). The Edward Dean Museum in Cherry Valley is opening a new exhibit on print culture and books on September 14th. Rebecca will be hosting an informal gathering for Material Cultures of the Book Working Group members and guests after the exhibit opening, so let her know if you would like to attend! Edward-Dean Museum presents a new exhibition, Secrets in the Script This exhibit examines the impact and beauty of printed words and images from the 16th to 19th centuries. Visit to see how coffee houses became the meeting places where all could gather over a “cup of brew.” Pick up a free cup of coffee to enjoy while you view prints and rare books from the Edward-Dean Collection. Book Arts in UCR Rivera Library Special Collections! 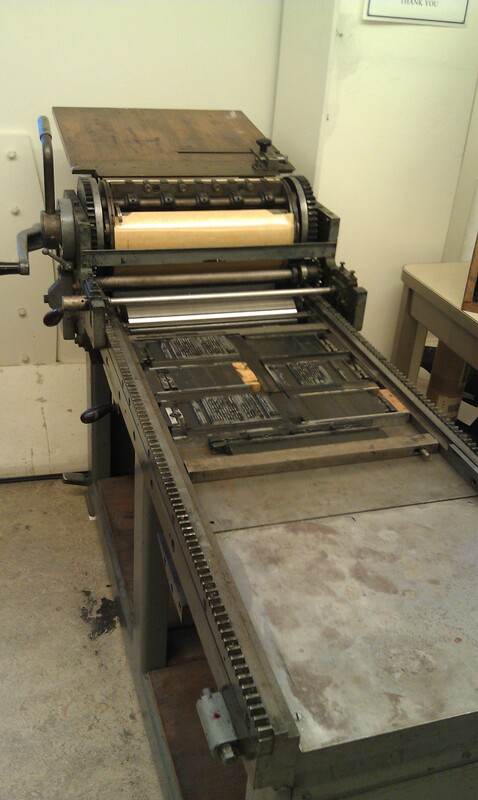 A few of us in the Material Cultures of the Book Working Group are taking a printing class for the DE BAM. It’s really amazing to be able to learn how books are constructed first hand, but it is also a very time and labor intensive process. This photo is from my first print run on a 32 leaf octavo pamphlet. It took me 2 days of trial and error (along with a mid-print-run set-back), but it turned out well in the end. Our April Meeting will take place on Tuesday April 30th at 3:30pm (location TBA). For this meeting , Schuyler Eastin will provide a theoretical reading to guide our discussion of some medieval manuscripts. We look forward to seeing you there! Header image: "Plates of the Printmaking Process"